Well.... Here it is... Our New Cover! Ms. Virginia Palmer is so talented! I just love our new cover! This scene is inspired from the lovely view of Mt. Pisgah as one might look out over the landscape from the side or back of the Biltmore House. Although it is not immediately as identifiable as our original cover, I think it is beautiful! Thank you, Ms. Ginny, for being so gracious and for your outstanding work! You're the best! 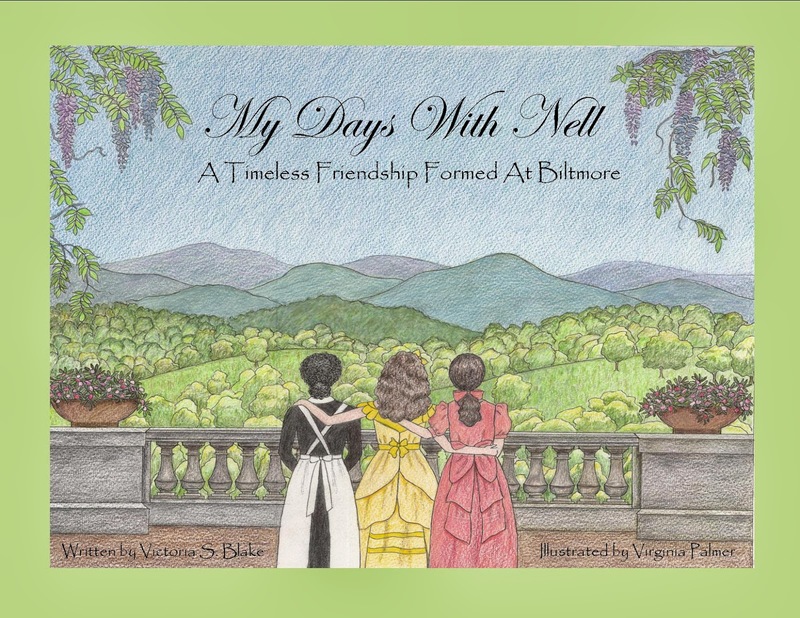 The wonderful folks at the Biltmore Estate graciously blessed us with permission to use their trademark image of the beautiful Biltmore House on the original printing of "My Days with Nell." Now that those copies are almost gone, it is time to redesign the cover. I certainly did not want to lose the original drawing of Nell, Lilly and Ellen Jorith looking at the home of George Vanderbilt. I thought it was gorgeous and was the image I saw in my mind when I was writing the book. But, I have kept my word and am extremely grateful to Biltmore for their generous gesture. 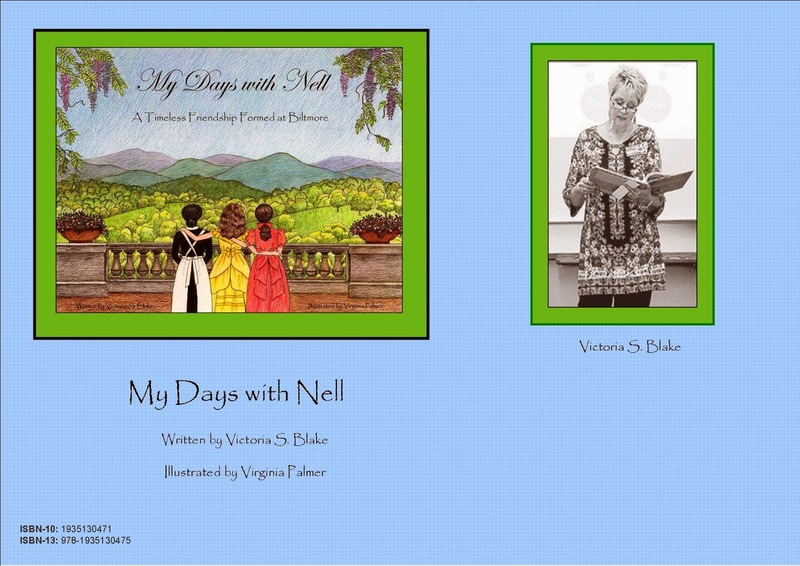 I met with my talented friend, Virginia Palmer, who did the original artwork for our book. I absolutely love her to pieces! She is so sweet and listened intently to make sure that she would create artwork to match my imagination. And that's not easy! Last Friday, I saw her initial drawing and I loved it. I'm happy to report that it should be done in a few days! As soon as it is complete, I will have it scanned and deliver it to Micki Cabaniss Eutsler at Grateful Steps Foundation, LLC. It will take a day or so to upload our book but then it will be on the way to the printer. Our target date for the receipt of books from the second printing is Thanksgiving week. I can't wait for you all to see the new cover. I hope you will like it! Today was my birthday. . . This was my present! My book, "My Days with Nell", was on the shelf of the Bookstore at Biltmore! I have such a deep respect and love for the "House", this was a dream come true and the answer to many prayers. I am beyond grateful! Asheville for tuberculosis treatment in the early 1900s. Estate will be carrying the book in the estate's shops. Another Wonderful Day! Thank you William and Grace! Yes... I had another wonderful day at a book signing! This one at William and Grace Children's Boutique was special for many reasons. Of course, Brenda and Thea, owners of this lovely place, were precious as usual. They are so warm, welcoming and hospitable. They met every need I could have possibly had and went above and beyond to make me feel comfortable and "at home." I also had the privilege of having my publisher, Micki Cabaniss Eutsler, attend this event. She is such a treasure! Such an ultimate professional and so kind! She has supported me throughout this entire publishing endeavor with patience, love and respect. I appreciate her so much! And if all this wasn't enough to bring a smile to my face, I met some of the nicest people today! A special lady from Minnesota spent time with me asking questions, and sharing her love of the Biltmore House. I loved visiting with Jean, she is such a nice lady. There were many others, which unfortunately I failed to catch their names, that came by to chat or have me sign their books. Well, like I said in the title of this post, it was another wonderful day! I have been so blessed to be able to share my book with such kind and generous folks that share my passion for the Biltmore Estate. I have loved every minute of it!